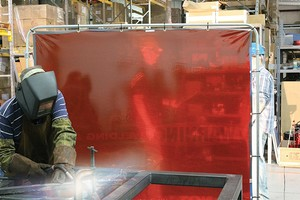 One-Way Printed Welding Screens might be the best thing to happen to welding since the welding helmet. They provide a temporary barrier around welding work, and they inform workers about areas where welding is being done. And, the screens are designed to let welders see through them. The 14-mil transparent vinyl is NFPA 701 approved and protects workers from UV light, flash burn, sparks, fumes and flying debris. Each includes a safety or motivational message that can be read by those walking by. Welding Screens are available in 6′ x 6′, 6′ x 8′ or custom sizes. The screen edges are hemmed and sewn with brass grommets. Black zip ties hold the screens in place. They are easy to move and can even be used as a partition when they’re not needed for welding applications. 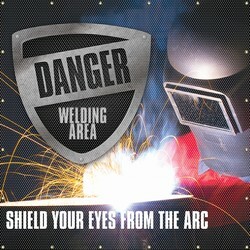 Check out the wide selection and order a Welding Screen at the Mallory Custom Sign Specialty Site. Mallory offers hundreds of customizable safety identification solutions. Choose from floor safety signs, safety tags, motivational messaging, caution signs, dangers signs, and even hard hat labels. Browse through the huge selection today and make your workplace just a little safer. Email orders to signorders@malloryco.com to find out more.